As per the new leaked invite from the Samsung, the company’s new flagship is all set to launch on 2nd August 2016. The invite shows a 7 and ties in with previous rumors that the company will this time around call their smartphone the Note 7 to tie in with the Galaxy 7 naming system. As per the today’s report (25th June) Evan Blass, it is confirmed that the device will be named as Samsung Galaxy Note 7. As per the Wikipedia Samsung Galaxy Note is a series of Android-based high-end smartphones and high-end tablets developed and marketed by Samsung Electronics. The line is primarily oriented towards pen computing; all Galaxy Note models ship with a stylus pen and incorporate a pressure-sensitive Wacom digitizer. All Galaxy Note models also include software features that are oriented towards the stylus and the devices' large screens, such as note-taking and digital scrapbooking apps, and split-screen multitasking. The Galaxy Note smartphones have been considered the first commercially successful examples of "phablets"—a class of smartphone with large screens that are intended to straddle the functionality of a traditional tablet with that of a phone. Samsung sold over 50 million Galaxy Note devices between September 2011 and October 2013. 10 million units of the Galaxy Note 3 have been sold within its first 2 months; 30 million were of the Note II, while the original Galaxy Note sold around 10 million units worldwide. 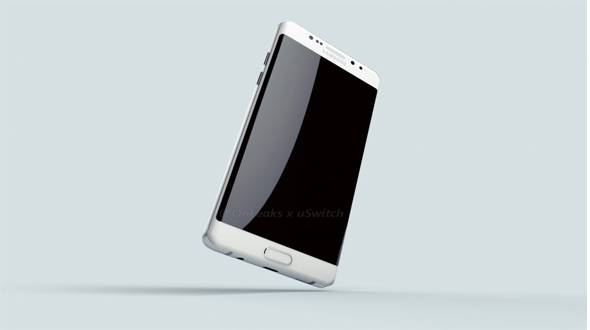 Previous leaks mentions that the Galaxy Note 7 will have a 5.8-inch QHD curved edge display, a Snapdragon 823 SoC chipset for the US and for global launch an Exynos chipset, an iris scanner, IP68-certified water-resistant body, a USB Type-C port, and a 4,000 mAh battery.